While the rest of my house has a lot of darker blue and gold tones, I wanted my craft room design to be bright and cheerful. 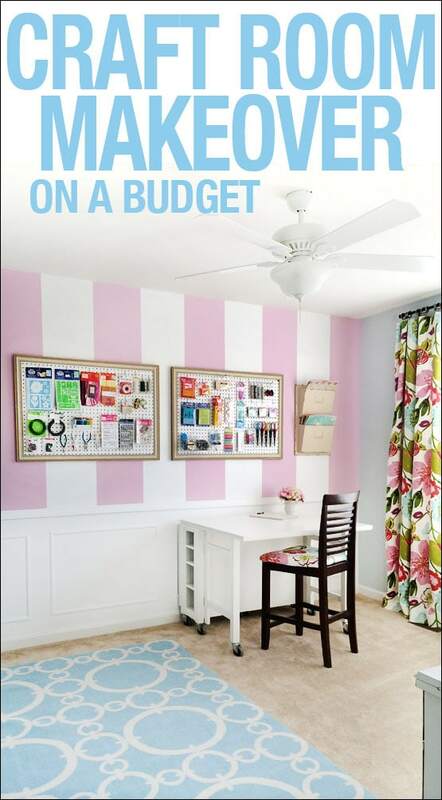 I thought it would be fun to have a pink striped accent wall, something girly. To scale it back a bit I added some DIY picture frame moldings for under $30. 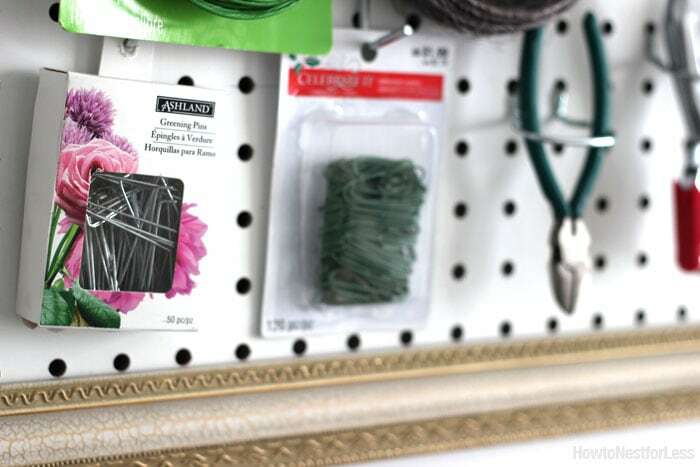 Another idea to keep the costs low in this room was to recycle the framed peg boards from my craft room in the old house. These boards really help me stay organized and cost next to nothing to make (the 4x8ft peg board was $18 and a package of peg board hooks from Lowe’s or Ace Hardware was under $10). On the adjacent wall is a white dresser that I use to hide a bunch of craft supplies. 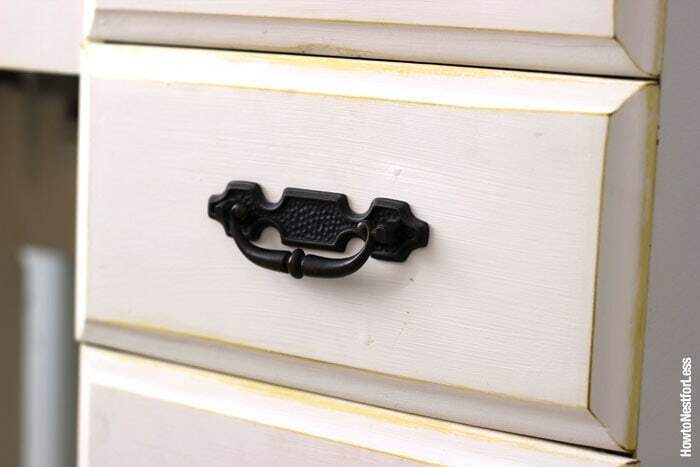 Six huge drawers to fill with goodies. Someday soon I’ll give you a peek inside those drawers. You know… once I organize all of the things I just shoved inside. 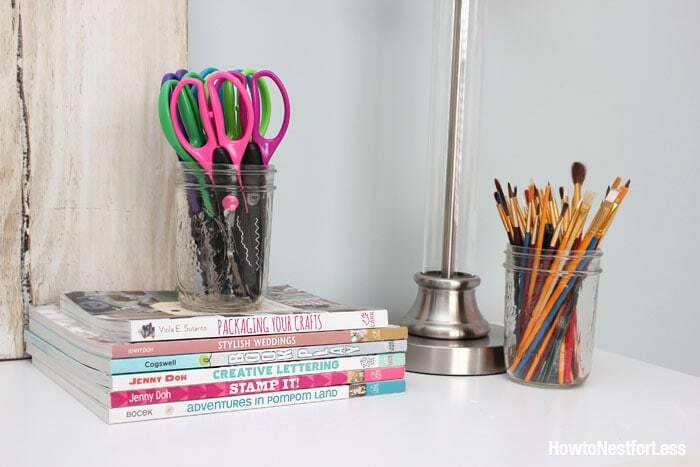 I use a lot of mason jars for organization throughout my craft room to hold paint brushes, craft scissors, pens, pencils, etc. I also keep some craft books and design magazines around for inspiration. In between the door to the room and walk in closet door is a small sewing desk. This old sewing desk actually belonged to my aunt’s mother back in the day. I gave it a chalk paint makeover in the old house and it’s held up wonderfully. Still love the yellow peeking through. The top is just filled with random everyday items I use. 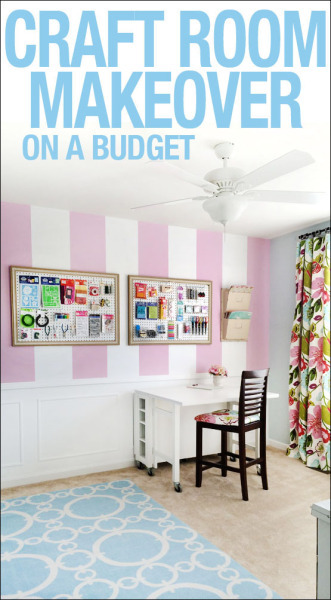 I love the mirror above because it reflects the pink stripes from the opposite wall. The last wall is mainly just a large double window with my no sew curtains. Still obsessed with this print from the Online Fabric Store and the natural light that floods in from this window. 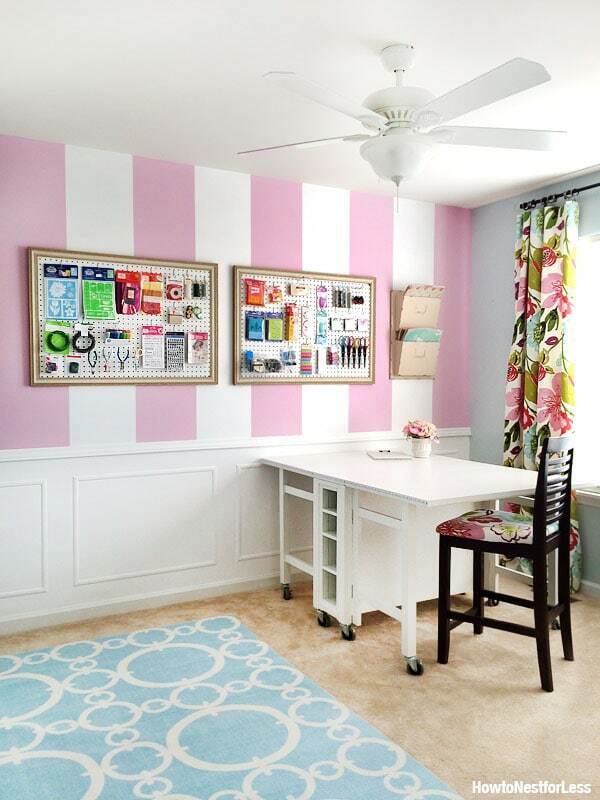 The craft room desk is from Home Decorator’s Collection and I would buy it again in a heartbeat. I love how it’s collapsable and is so easy to extend when I’m working on a big project. And it’s on wheels which makes it easy to scoot around the room. Although that’s kind of why I opted for a smaller 5.3 x 7.5′ area rug from Amazon for only $55. I didn’t want the craft table to get stuck on the rug and cause it to ripple. When the craft table is fully extended it’s 60 inches long. LOTS of creative space. 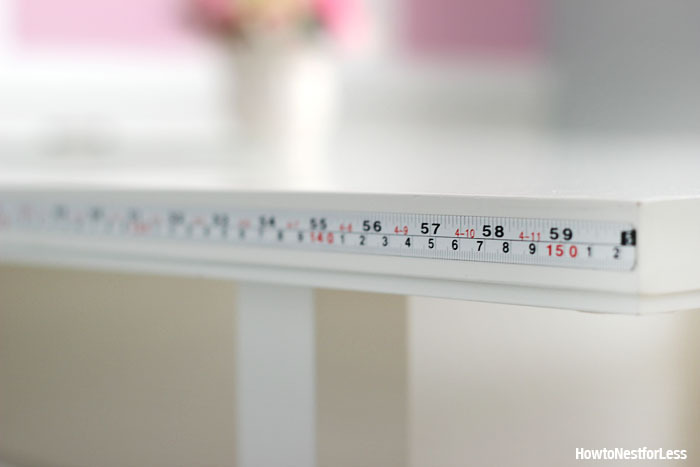 Plus there’s a ruler on the side, perfect for measuring fabric. 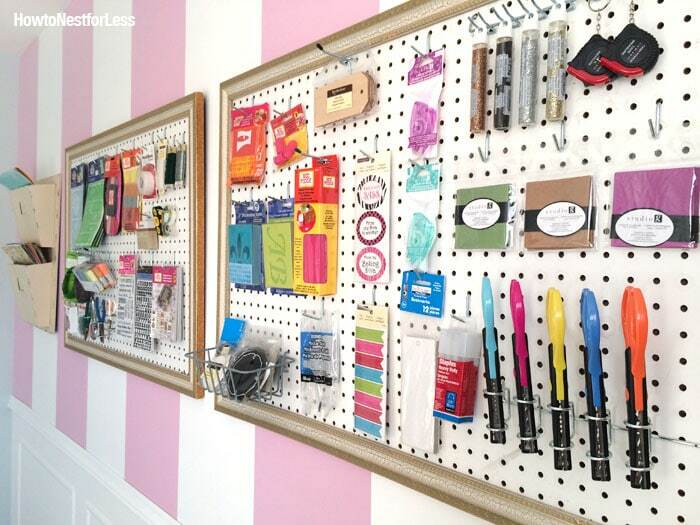 And like I said my peg boards and tools are just above my desk within an arm’s reach, just staring at me to get crafty. I think they know Christmas season is right around the corner and I need to get busy. 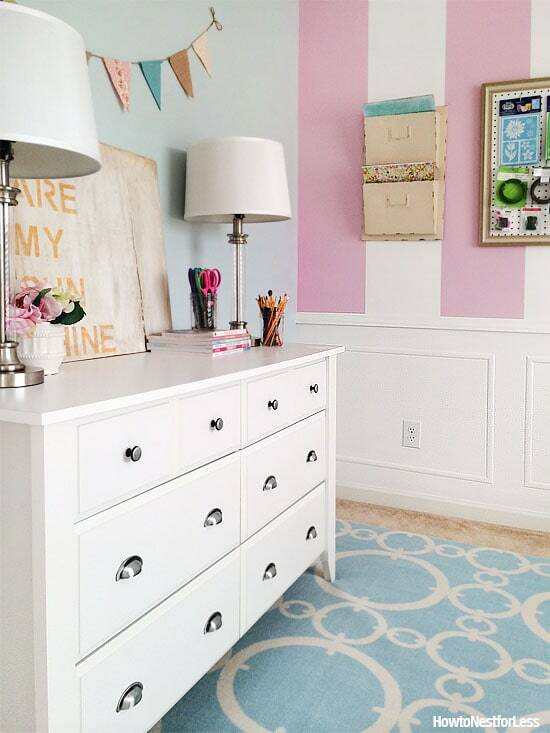 Well, that’s it for colorful craft room tour! I guess it’s on to the next room in the house. Hmmm…. the dining room or the master bedroom? I absolutely love this room! So bright and airy! 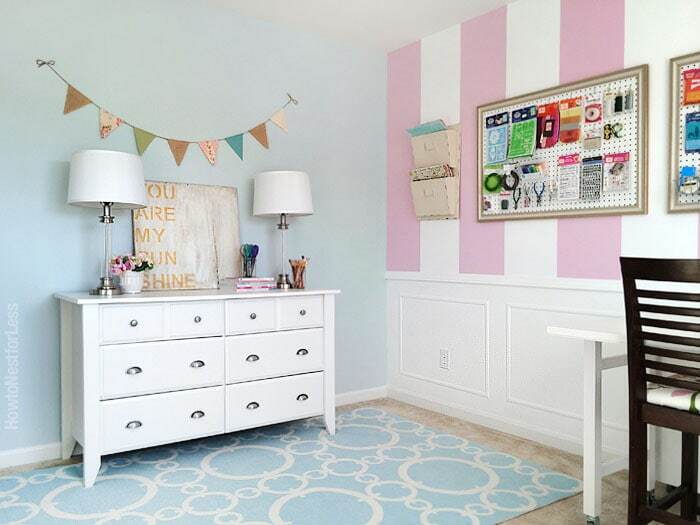 Love the striped walls and picture frame molding! It looks fantastic! Stunning!! Love everything about it! And I say to do your bedroom next, I need some inspiration for my own! 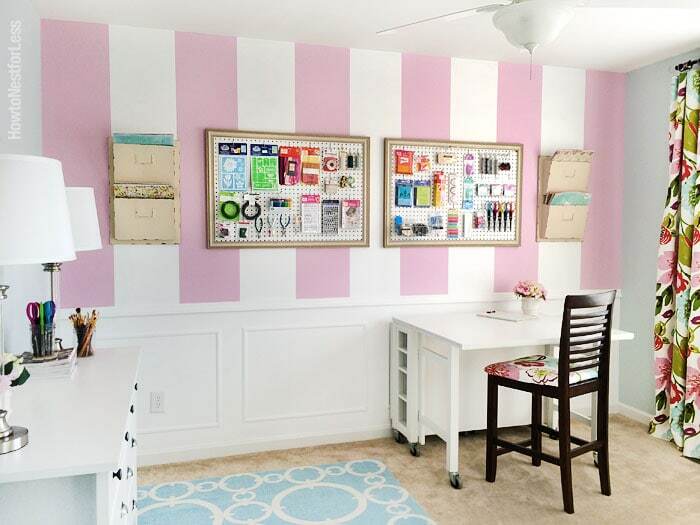 I love everything about your craft room! It’s so beautiful and you did a great job tying everything together! Turned out beautifully – so cheerful and bright! I am obsessed with the curtains print too! Thanks Jenny! That fabric definitely makes the room! Love it! 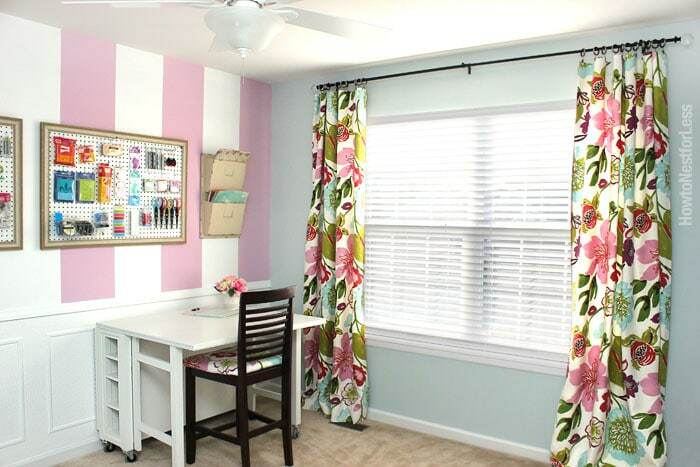 The curtains are my absolute favorite– LOVE that fabric. 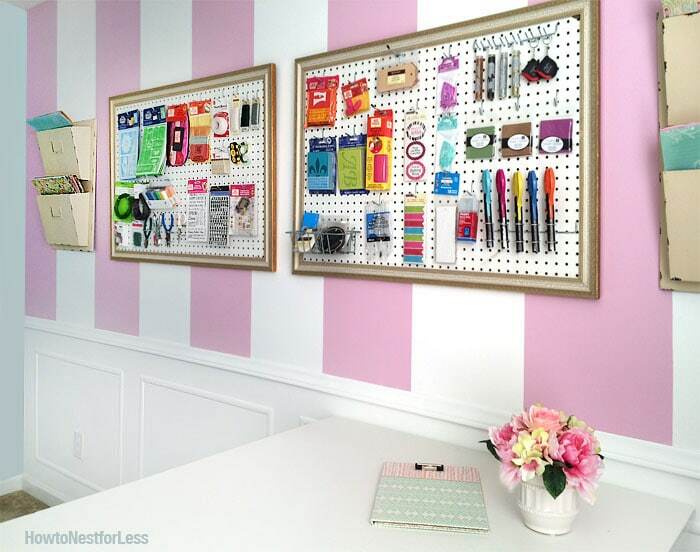 Whoever said to put those two peg boards on the striped wall is a genius. 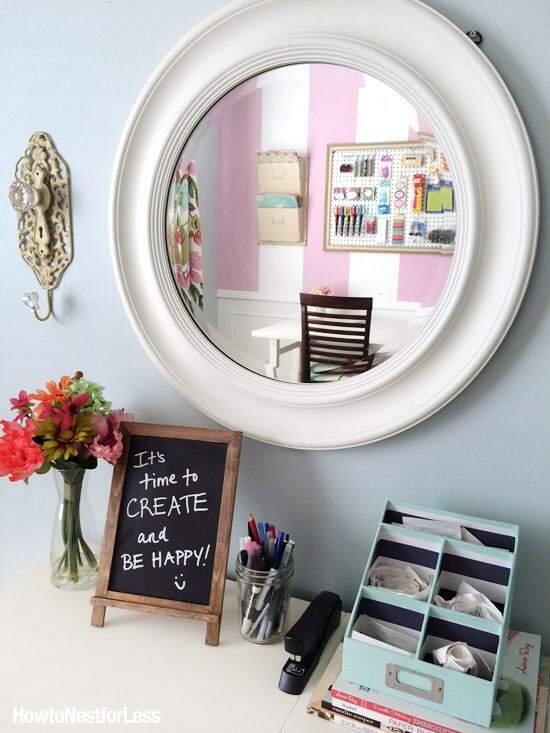 Now, let’s discuss the fact that you have a walk-in closet in your craft room. Just curious why you decided to get rid of the Flor tiles from your craft room after about 2.5 years. I ask because I am considering using Flor tiles for our home. We didn’t get rid of them. We moved! The new craft room is in our new home. 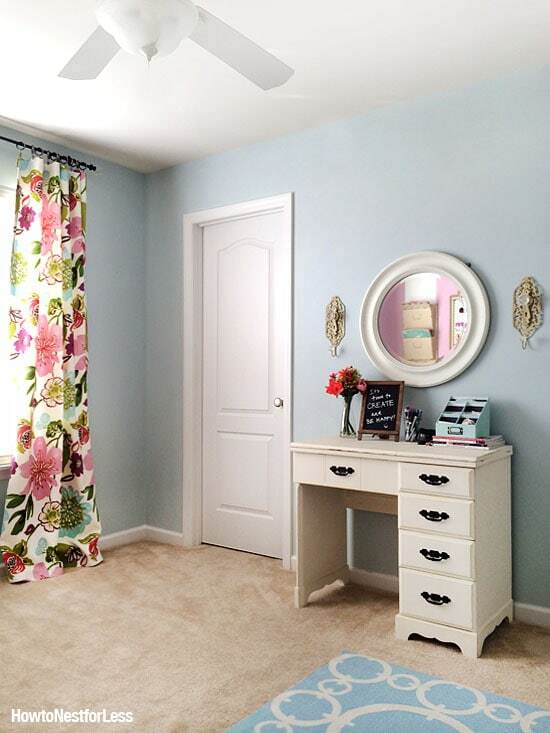 I know this isn’t your current house anymore, but do you remember the name of the blue gray color on the 3 non-accent walls? 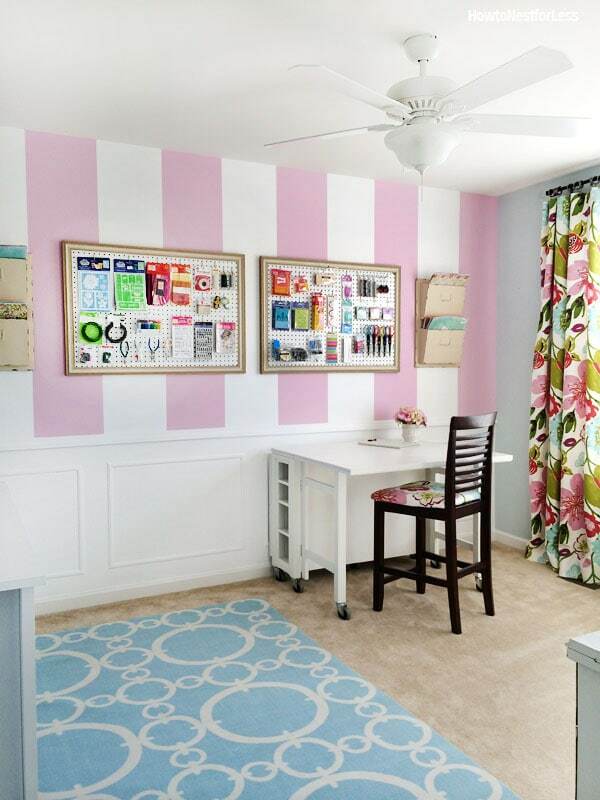 This is such a cute craft room! Oh shoot, you said the blue gray color, haha! That is Caribbean Breeze from Clark+Kensington at Ace Hardware!